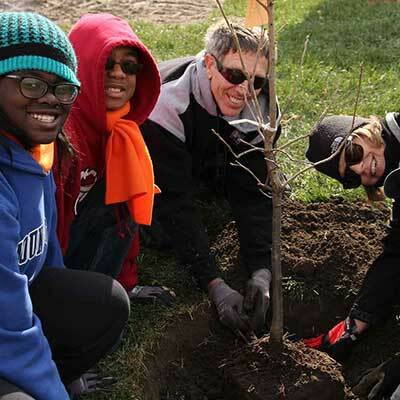 Become a member of the Arbor Day Foundation for as little as $10 and receive 10 trees planted in our Nation’s forests in your honor. Our Nation's forests provide wood, habitat, clean air, and drinking water for millions of us. Your trees will help preserve these precious resources for this and future generations. You’ll receive a 33 percent discount on over 100 trees and shrubs. Our selection includes shade, flowering, ornamental, fruit trees, evergreens and more. Free subscription to our colorful bimonthly newsletter. Arbor Day is a gardener’s handbook and tree information guide in one. The Tree Book is a treasury of genuinely useful guidance about planting and caring for trees in a cheerfully colorful format. Members and supporters have helped plant more than 30 million new trees in our nation's forests devastated by insects and fires. Our support to on-location education to local communities for sustainable forest management helps save the earth's tropical rain forests. Delivering new trees to help bring healing and hope to communities after natural disasters. More than 3,400 communities take great pride in practicing sound urban forestry and being recognized as a Tree City USA.